Renowned Guitarist and Harp-Guitarist Muriel Anderson will be performing “Wonderlust” Visual Show at Songbirds North Stage, 35 Station St. in Chattanooga, on Feb. 8. at 7 p.m. Tickets are $20. One of the world’s foremost fingerstyle guitarists and harp-guitarists, Muriel Anderson is the first woman to have won the National Fingerstyle Guitar Championship. Her CD “Nightlight Daylight” was chosen as one of the top 10 CDs of the decade by Guitar Player Magazine and her “Heartstrings” recording accompanied the astronauts on the Space Shuttle Discovery. 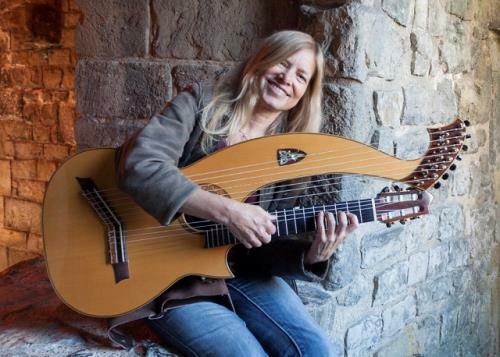 Guitar World Magazine listed Muriel Anderson as one of the eight most amazing female acoustic players and is one of the few international touring harp-guitarists. Among those she has performed/recorded with are Chet Atkins, Les Paul, Victor Wooten, Tommy Emmanuel and the Nashville Chamber Orchestra. Her obvious joy of music, humor and her facility across the genres of folk, classical, jazz, bluegrass and international music is revered by guitarists worldwide. Muriel is host of the renowned Muriel Anderson’s ALL STAR GUITAR NIGHT® and founder of the MUSIC FOR LIFE ALLIANCE charity.